The main objective of this new line stage pre-amplifier is to have the ability to drive 600 ohm input impedance of the complementary WE-300B paralleled Single Ended amplifier while totally committed to the utmost "Simplicity Concept". We simply choose a single gain stage circuit with 6922/6N1P high performance signal Triode directly coupled with our SILK L-531S interstage line output transformer with natural 600 ohm output impedance. In theory this simple circuit is the best way to build a pre-amplifier since the signal only pass through a single gain stage. There are two main types of a single gain stage circuit in audio use. (1) The more commonly seen type is a single gain stage with resistor / capacitor coupling. This circuit type is simple but the performance is fall short due to many reasons such as high output impedance (usually a few kilo-ohms range which limited its driving capability), phase reversal from input to output (this means that the signal is out 180 degree), high energy lost in plate node ( a plate resistor usually has a value of more than 10 Kilo-ohms that will cause big voltage drop and generate heat), and worse of all, the output signal must go through a coupling capacitor. Although this type of circuit is cheap to implement and could produce tens of output voltage swing, it can barely drive any low load impedance or long interconnector cable without causing very high distortion. (2) By choosing interstage coupled line output transformer, we could eliminate all bad side effects since interstage coupled offers: Low output impedance (usually 600 ohm for line driver), no phase reversal, lowest energy lost in plate node since interstage has very low equivalent resistance (usually less than 1 Kilo-ohm), and best of all there is no coupling capacitor to add charactor to the output signal. The charllenge is to find a good quality interstage transformer. 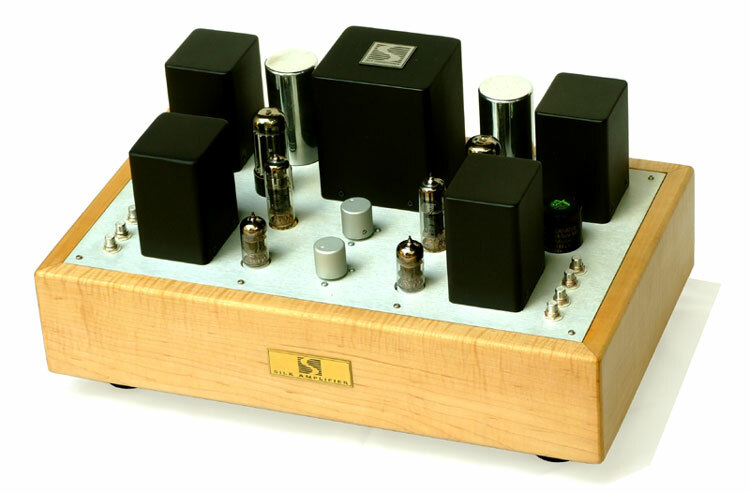 So far 99% of tube amplifier manufacturers avoid choosing interstage transformer for good reasons, it is the most expensive parts of a whole product, it is very large and heavy when compare to implement another circuit with a few more tubes, and most never be able to succeed making a good interstage transformer by themselves. Our core business in making unparalleled quality interstages and output transformers under our own brand "SILK" sets us apart from the rest. With ability to design the product from ground up, ability to build & testing and successful track records in building many custom made amplifiers/custom made transformers these contributions help build our experience to deliver astronishing performance interstage transformer, thus truely elevate the basic single gain stage circuit to another level. 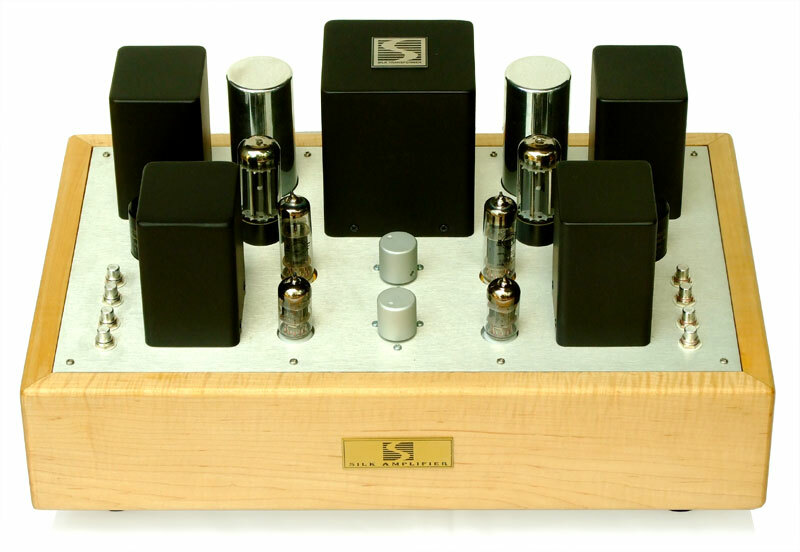 Besides arming with the purist philosophy of single gain stage with highest quality interstage transformer, we equip this custom made pre-amplifier with dual power supply (one for each channel). 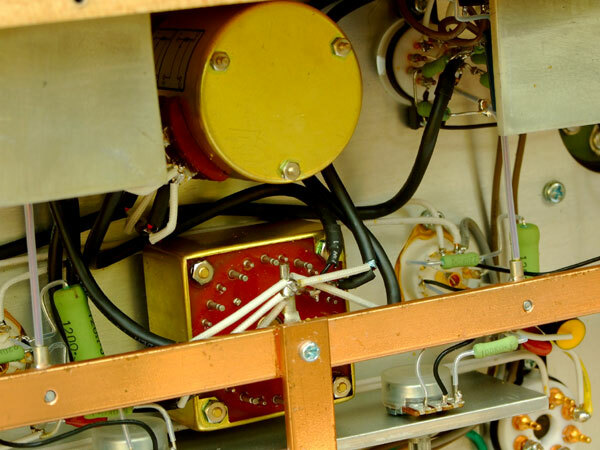 A main power transformer (SILK Custom made) consists of two separate windings each to feed left/right power supply separately. The main power transformer is electro-static and electro-magnetic shield to suppress any noise from the main AC line voltage. Each power supply is vacuum tube rectification (5Y3) to C-L-C configuration (ASC Oils capacitor), handwound SILK DC choke, and Black WKZ capacitor. 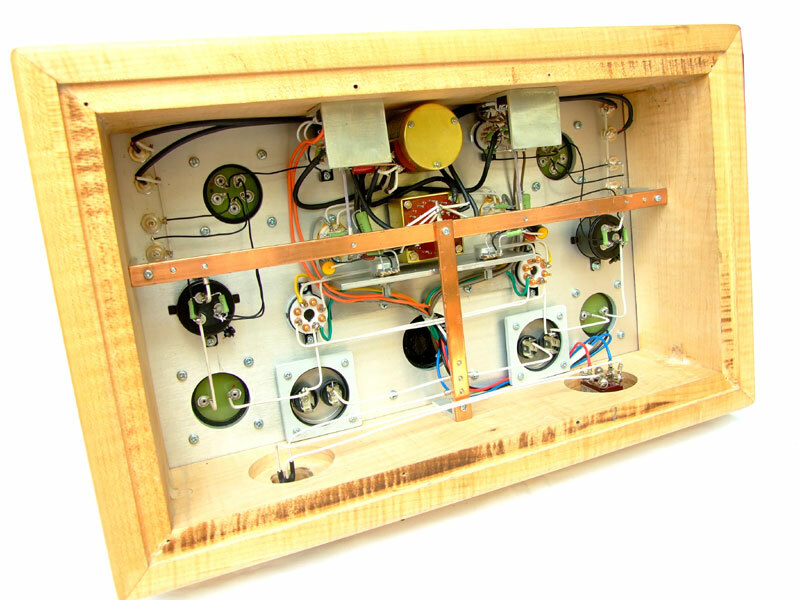 After that each power supply is fed to a separate vacuum tube regulation (6BM8) to further deliver clean and powerful energy to nurish the simple gain stage circuit. At the center of the power supply system features solid square OFC copper bus bar to form unrestric current path to the whole system. Ultra rare TKD switch selector (square golden box) and ultra rare TKD volume control pot are just the two extra high performance parts infront of the gain stage circuit. We combine the highest quality parts selected for this project like precision carbon film resistors (Kiwame), Gold Plate Teflon sockets, Solid Silver hook-up wire and all silver soldering. The whole system truely deliver stunning sound with lowest noise to extend music enjoyment. Figure 1 illustrates harmonic content of 1KHz sinewave. The major harmonics are still the 2nd and very small 3rd harmonic, sign of very pleasing perception. 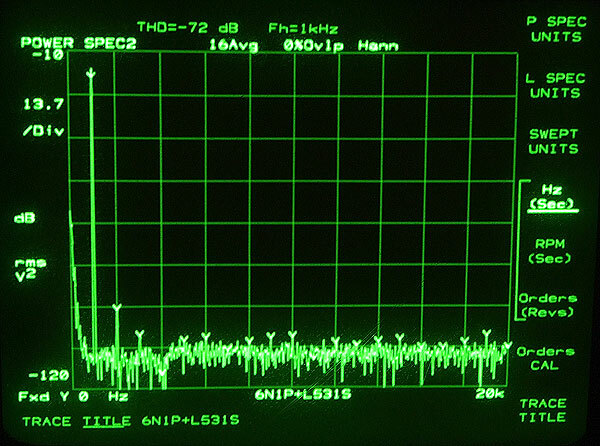 THD of -72dB is equivalent to only 0.025% for a full 1Vrms output driving 600 ohm load. This pre-amplifier circuit combination is totally surpass its objective of low output impedance and very low distortion. Figure 2 illustrates frequency characteristic vs phase response. There is a very small and natural roll-off above 20KHz when the volume control level is set at 1/3 position (the usual position that our client use when listening to music). 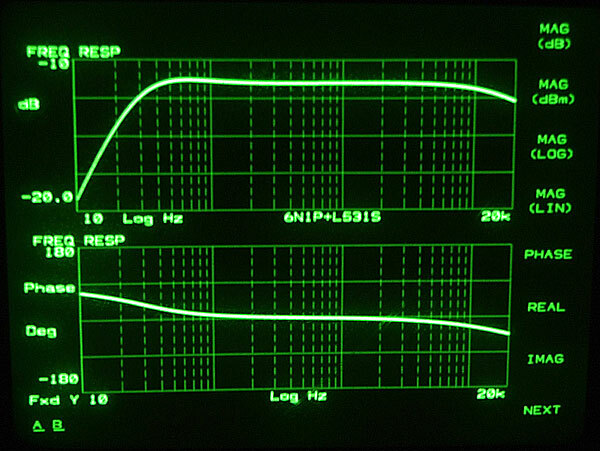 Therefore the complementary WE-300B amplifiers have been fine tuning to have same level of inverted response above 20KHz. Final combination pair will give near flat response up to 50KHz under real listening position. 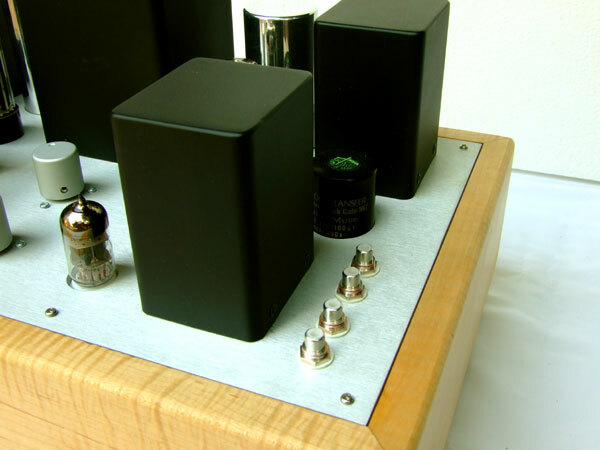 When we design, build and fine tuning these pre-amplifier together with its complementary WE-300B PSE we learned that each circuit element, parts and transformers interact in different ways and by recognizing those differences is the most valueable experience and joy. The information represented here is for reference to future custom made to order audio project. For future project we welcome any requirement.